Hyperar had the most liked content! Yeah, i look around and it seems a pretty common issue with the Goon 1.5, those who fixed the issue (not all AFAIK) disassembled the whole thing and gave it a good clean, i did it and it works much better, not perfect (reads a little bit high) but resistance not longer jumps, i'll give it another clean to see if it reads resistances accurately. Thanks for your response. 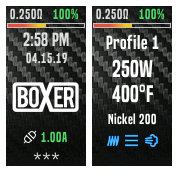 Thanks for bringing this to my attention, i wouldn't have found out otherwise since i don't like to reset my puffs, i'll upload a fixed version later today. I'm glad you're enjoying it. statistics Undo reset puffs possible? 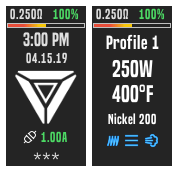 Hi everyone, due to a confusing custom theme, i reset my DNA250C statistics, i'd like to have them back, is ti possible?